Examine your career goals! Think deeply about your professional objectives and see if attending a graduate program will help you meet your goals. The website What Can I Do With This Major can be a great starting point in looking at a particular field and determining if you need to pursue graduate school. I am a first-year graduate student here at Saint Rose in the School Psychology program. My goal is to be a school psychologist. 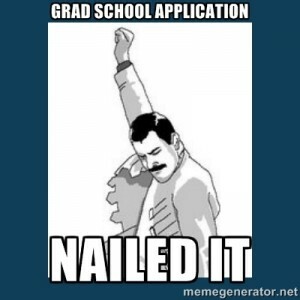 In order to achieve this goal, attending a graduate program was a requirement of the field, so I knew it was in my future! “I don’t want to be just a number” is a phrase you would often here me say about the size of the schools where I was looking. For me, being in a program where you can make personal connections with your professors, as well as fellow students, was very important. Is it important to you? Or do you like the larger setting, a more university feel? These are all important factors to keep in mind during your graduate search. GREs, LSATs, or MCATs are examples of specific standardized tests that are required for admission to some (but not all) graduate programs. Some schools that I applied to required that I take the GRE exams and others didn’t. It’s always important to check each individual school’s application requirements first before assuming that standardized test scores are required for admission. For more tips and advice about graduate school, stop by “Coffee and Questions” in the Career Center (3rd floor of St. Joe’s); we will be available to chat anytime on November 11 from 3pm to 5pm AND November 12 from 12pm to 2pm! If you are unable to attend a meeting, stop by the Career Center during our walk-in hours (Monday-Wednesday, 12pm-4pm) or schedule an appointment to have your questions answered. 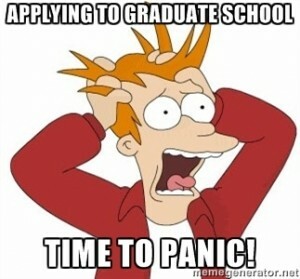 We also have some resources on our website to help you get started with considering graduate school.